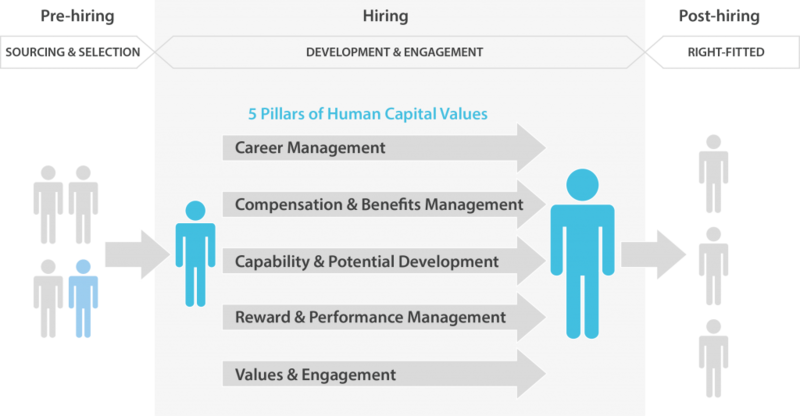 H-ARPA proudly delivers the professional consultation for your business growth with high potential human capital. For the efficiency and effectiveness result, our most optimized consultation to contribute clients to meet the business and corporate goals are in 3 main service approaches. Project Based Approach is the main service of H-ARPA. All of deliverables are customized to client’s situations and needs. H-ARPA is to provide solutions which are the most optimization of our clients. 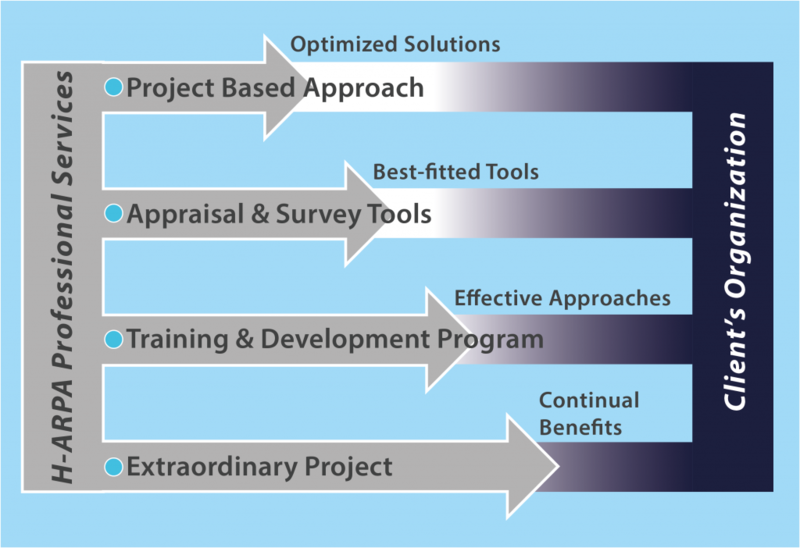 Although the deliverables are tailors to be the best-fit, all are optimized to clients based on the best practice and principle.For efficiency and effectiveness of optimization, H-ARPA proudly provides 3 methodologies on this project based approach. Appraisal and Survey Tools are the most of our specialization as well. H-ARPA always focuses on the tools which are valid and reliable to our client. In the same words, the standard tools have to be customized into unique situation and needs of each organization before using as application. To customize an appraisal or survey tool properly to a client, H-ARPA applies it on result objective and appraisal (survey) approach. This is to ensure that the tool has highest validity and reliability for this client. Training and Development Program is one of H-ARPA professional services that is integrated between essentials of knowledge and organizational situations. This is further than applied training course but our services are the continual programs in various learning approaches for individual learners. Our designed training and development program is to ensure that all learners and developers can understand basic thought of each know-how and naturally apply into their thinking process, personality and attribute. The key point of effectiveness and efficiency of development program is what competencies are individuals should or have to be accurately developed. 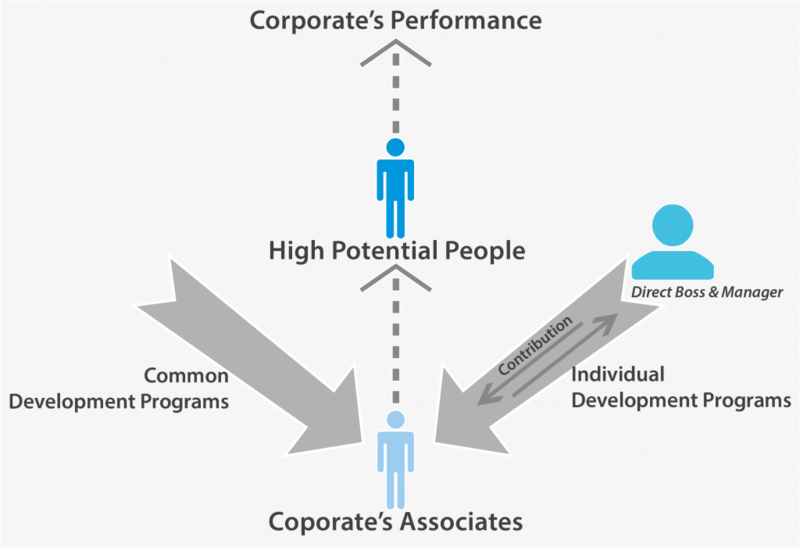 That is individuals should be identified strengths and out-of-condition competencies, contributed to corporate and business goals, before designing development program or approach. (3) The approach and application to follow-up how successful individual can do along with the program and improve needed competencies. Project Based Approach is a channel to access the professional services of our Training and Development Program to establish the systematic program, such as Training Master Plan, IDP (Individual Development Plan), Talents Management and Development. Furthermore, while organization has certain requirements of associate’s development area, the channel to access is also In-house Training Program and Public Training Program. Extraordinary Project is found from the special requirement of organization who needs to implement solutions with fully efficient efforts. So H-ARPA provides services on our professional areas to surely meet the achievement of proposed solutions or executive’s satisfaction. The extraordinary project is an friendly interaction which H-ARPA works closely with executives, management level, or responsible team for implementation in each organization. This project sometimes calls as an Executives Coach, and High Potential Recruitment Program, etc.